Thai Phien Hamlet – an original administrative unit of 12 Ward (Dalat city, Lam Dong Province) was established in 1956. Although it was considered to set up later than others in the past, Thai Phien Hamlet now has become a rich land and people here have wealthy lives because of owning a traditional village developing and expanding domestic and foreign markets. I returned Thai Phien flower village (Ward 12- Dalat city) on October 15th , though more than two months left before the New Year on which Dalat welcome major cultural events taking place, it seems that this traditional flower village on the plateau was bustling to prepare for great festivities. It looks like floriculture (besides purely making livelihood) is an elegant hobby of flower farmers and it makes them become gentleman, kind and very hospitable! Ho Ngoc Dinh - Chairman of Ward Farmer gave me a very warm welcome. He smiled brightly and said: “These days, customers around the country and over the world come to Thai Phien flower Village to visit and learn production experiences with large farmers, including newspaper-radio reporters. Therefore, receiving guests is regular work and also the honor of the local authorities and other unions in the ward. The President of Ward Farmer Union cheerfully took guests to visit house-gardens specializing in high quality flowers planted by farmers in the ward. There were many immense greenhouses built quite solidly and extended headline on the hillsides under the green valley sparkling in the sun in front of my eyes. Inside these greenhouses, each flower beds are planted and watered carefully for the new crop. Besides the immature flower beds, yellow silk noble of exotic daisies are blooming; orange, purple, white, yellow, brown lilies -senior lilies which is very popular in markets are brilliant in the garden and heady scent in the wind. The formation and development of Thai Phien Flower village today is closely associated with nearly 60 years of going through many hardships, ups and downs of its struggle history in the traditional revolutionary area. Before 1945, Thai Phien village is just desolate hills, and a hunting place was dedicated to only Bao Dai King; in 1954, there were about 40 Vietnamese families who previously lived in Xuyen Khoang (Laos) going home and deciding to live here. They realized that this region is pretty flat, and has rich soil, climate , rivers, lakes (Lake of Sighs) that are suitable for setting up strategic hamlets and cultivation; The farmers agreed to vote Mr. Le Phuong Mien (one of 40 households) to become a presenter of the hamlet. In 1956, he submitted to the Mayor Lam Vien, Mr. Cao Minh Hieu about his expectation to set up Thai Phien Village and was accepted - Thai Phien Hamlet was established since then. In the early years of village establishment, the farmers specialized in growing all kinds of fruits (persimmons), planting vegetables and some flowers from France, such as orioles, Lyons, red daisies, hydrangeas, roses, margarine, etc. In later years, the population of the central provinces (Thua Thien Hue, Quang Nam, Quang Ngai, Binh Dinh, Phu Yen and so on) flocked to there for settlements. Along with the increasing population, the scale of production is constantly expanding. In particular, the high-end flowers sources from countries: France, Japan, Indonesia, etc. 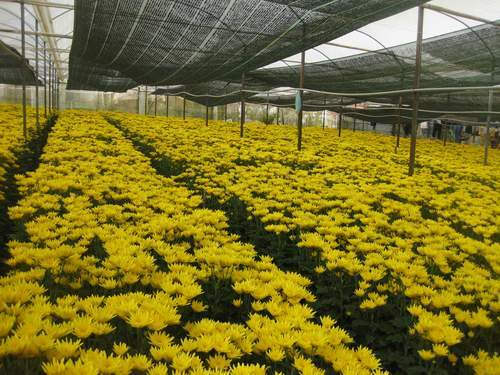 like daisies (over 40 species), auspicious, lily, white lilies, Salem, carnations, roses have been growing more and more – that begins to form Thai Phien flower village. The whole ward has 430ha of cultivated land for agricultural production: 320ha of applying high technology in agricultural products (e.g. greenhouses, net houses, automatic irrigation systems). 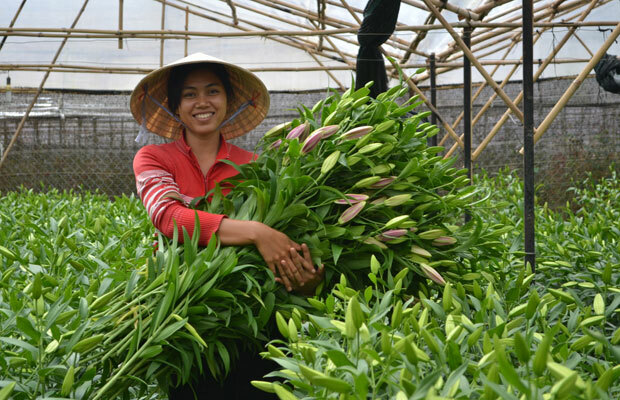 In addition to mainly growing flowers, artichokes on Ward 12 also accounted for large areas (40ha / 60ha of artichoke trees throughout the city), are the specialty crops in Dalat city bringing substantial revenue for farmers. There is Dalat Potato- vegetables Research Center (belonging to Institute of southern agricultural Engineering Sciences) having put into cooperation for years. 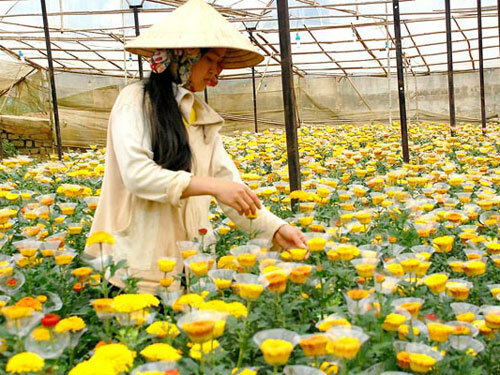 There are also 3 foundations of biological culture mediums; 12 cold storage preserving flower seeds and 10 units of commercial daisies providing seeds for local farmers, many other areas in Dalat city and the surrounding districts as well. These are very favorable conditions and good supports for local Thai Phien farmers to actively boost production of vegetables, and flowers at present and that prospectively open a flower-growing region in the future. Standing in the 2nd floor of the headquarters of Ward 12 (Dalat city), visitors glance at endless vegetable gardens, and flower gardens grown in greenhouses leading to vast green pine forests; both sides of new upgraded roads are luxury high-rises. Thai Phien people’s life changing day by day and this traditional flower village is full of vigor under the sky of the Highlands festivities. Dalat city- the city of pine forests is more and more beautiful and wealthy thanks to the formation and development of this over a century industrial flower village associated with naive gentle, hardworking and creative people here. 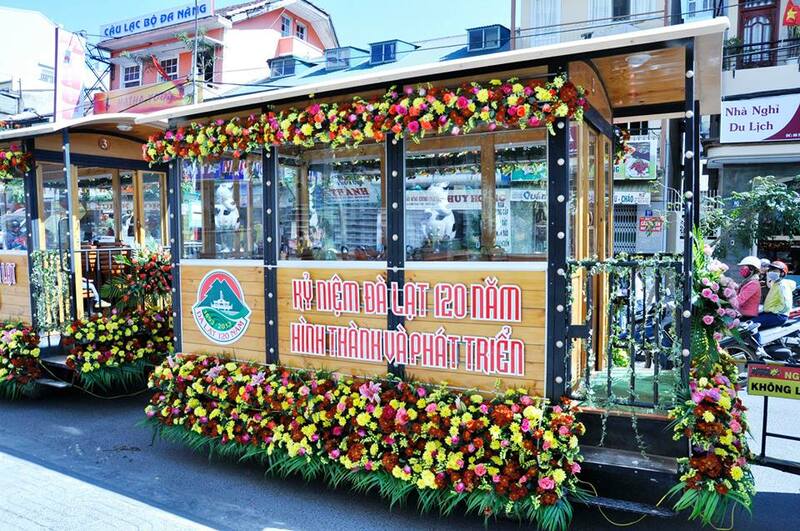 At the first Dalat Flower Festival held in 2005, Thai Phien flower village was honor to be introduced to the numerous friends in and outside the country. 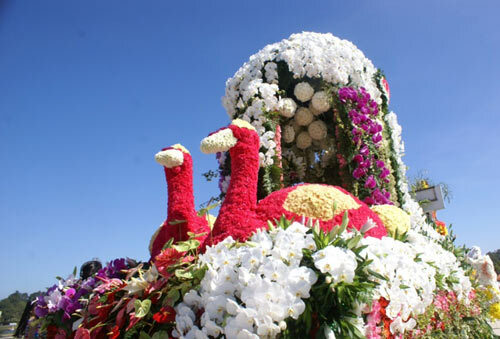 This is such an important that Thai Phien Flower Village continuously present the highest endemic flowers captivating the crowd at the next flower festivals. Especially, on December, 16tha great honor came to Thai Phien farmers is that Lam Dong provincial People's Committee issued Thai Phien Flower Village as “Traditional Village”. 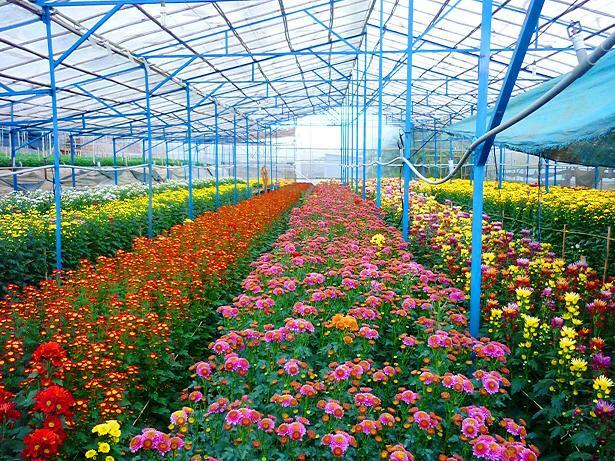 From this event, the Party, and the government of Ward 12 has built a Development Scheme for Thai Phien Flower Village period 2010-2015 ; in which the work focuses to change Thai Phien flower village into an industrial flower village. Clement weather- local peace and human interests have converged on Thai Phien hamlet! 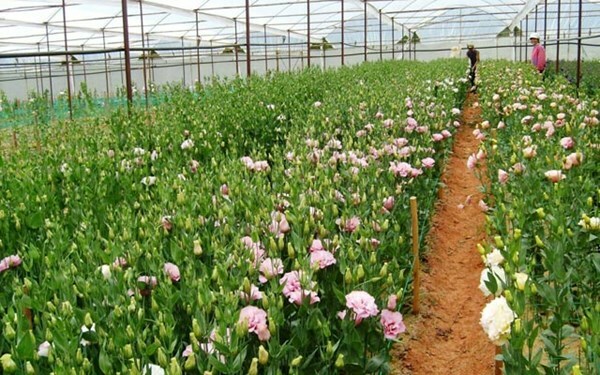 Thai Phien flower production continuously spike each year: 30 million stems/ year up to 300 million stems/ year and is now 450 million stems of all kinds/ year; revenue of each flower hectare is 550 million/ ha. 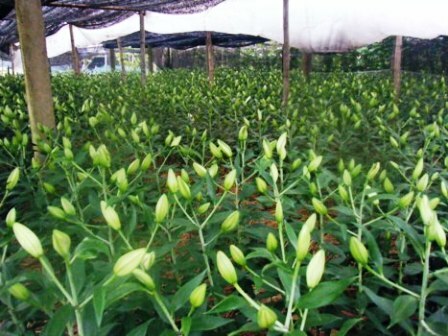 Thankfully, through the affiliate programs of investment and cooperation between Lam Dong provinces and other provinces; at present, the output of the fruits and flowers of the Thai Phien village is fairly stable. 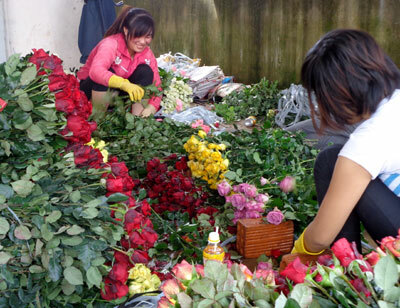 80 % of Thai Phien flower products are strongly consumed in HCMC through 3 major wholesale markets (Ho Thi Ky, Dam Sen and Binh Dien market); 10 % of its products sold in the markets of Hanoi and the north provinces and 10 % in the central provinces - Highlands. 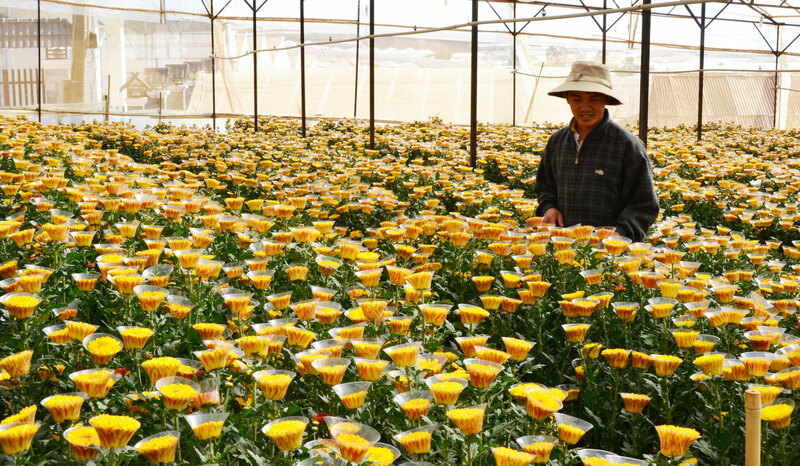 In recent years, the material spiritual life of the people in Ward 12 (Dalat city) has changed dramatically thanks to an increase of senior flower production areas, and an expandig product markets. Currently, more than 60 % of households in the entire ward have the average annual income of 200 million or more; particular, many households earning over 1 billion / year.